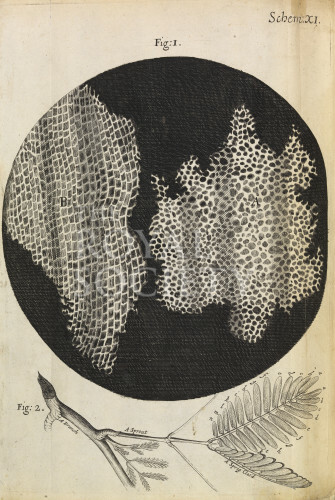 Illustrations showing a microscopic view of the cells in a sliver of cork (Fig. 1); and a sprig of the sensitive plant (Fig. 2, unmagnified). Schem. XI from Micrographia: or some physiological descriptions of minute bodies made by magnifying glasses with observations and Inquiries thereupon, by Robert Hooke (London, 1665).